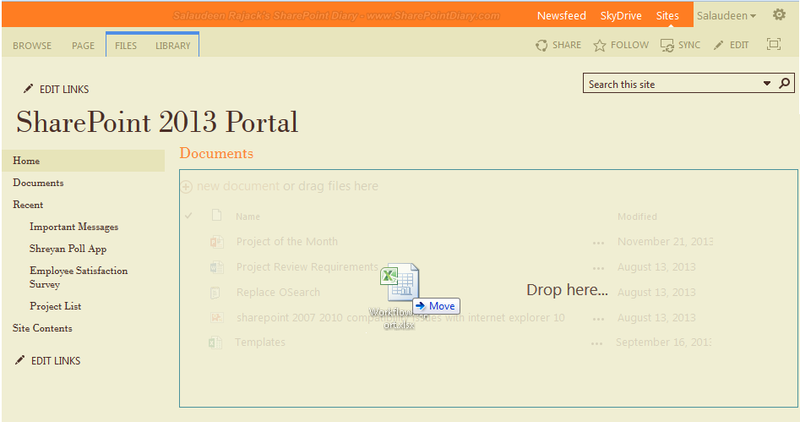 One of the cool new feature in SharePoint 2013 is the ability to drag and drop files directly into document libraries. We had a scenario where it didn't work! some users were unable to upload files into document libraries by dragging and dropping. They see only "New document" but "new document or drag files here" not visible. Which means: drag and drop not available for them! SharePoint 2013 drag and drop feature in based on HTML 5! So, the browsers which supports HTML 5, such as recent versions of IE 10 or above, Firefox, Chrome and Safari, drag and drop functionality in SharePoint 2013 works fine. As already stated, SharePoint 2013 drag and drop not available for IE8/IE9 when you don't have Microsoft Office installed on client machine. So, We can run SharePoint designer 2013 installer (Just choose "Office Tools >> Microsoft SharePoint Foundation Support" option, No need to install SPD 2013!) Having SharePoint Designer 2013 enables uses to drag and drop documents in SharePoint 2013. How about libraries with required columns? Well, when you upload by drag and drop, The file is checked-out and they'll have to check-in explicitly. user must have at least contribute permission to the document library, otherwise, they can't drag and drop in SharePoint 2013. Also, drag and drop functionality doesn't work for sub-folders. You can drag and drop only FILES. Use Explorer view to upload files along with folders! What if none of the above works for you? Use Explorer view!